It takes about an hour and a half to reach Mpepo from Mpika. The Health Centre lies barely a kilometre from the tarmac road. Again we were astonished to see satellite dishes on one or two of the village houses (see above video). 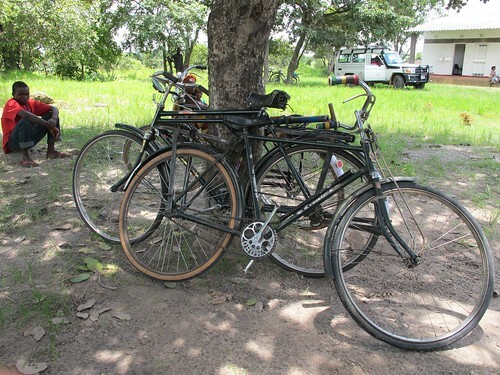 In Zambia, Health Centres, which are government run, serve a number of outlying Health Posts. Fridays are a busy day at the Health Centre. The yard was a jumble of bicycles, umbrellas and people. A toddler squeaked in delight every time the wind-driven water pump leaked a spray into the air. A crowd flocked around the entrance: mainly women with babies, but quite a few men with sick children, who these days may find themselves the main care-giver. Since we lived in Zambia in the 80s, life expectancy has dropped from 52 to 37 years, mainly due to HIV/AIDS, leaving many orphans, as well as extended families with only one carer – sometimes just an older child. 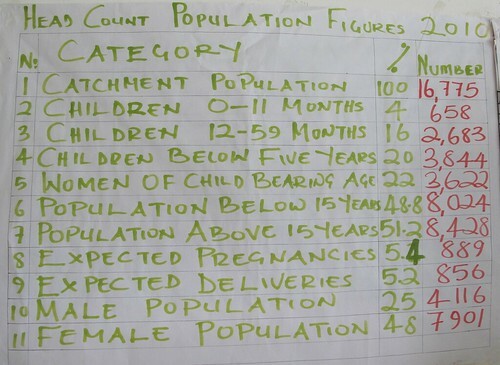 In the Mpepo clinic catchment, 20% of the population is under 5 and nearly 50% below 15. Among the adult population, there are 2 women to every man. Our contact Dr Nachi Kaunda had tried to call ahead and warn the resident Doctor, Reverend Samuel Chitundu, that we were about to descend on him unexpectedly. We found him sitting in a dark office half taken up with baled mosquito nets ready for distribution, a long queue in front of him. As it turned out, her message had not got through to his mobile, which was on charge. Yet still he received us graciously, and gave us twenty minutes out of his impossibly busy day to listen to what we had to say. ORS is usually available at Health Centres and Health Posts, and is free. But getting it means a long walk for the care-giver carrying a sick child, a long wait in line, and huge pressure on a single doctor, serving an area of perhaps 30 km radius. Rev Chitundu spoke of the challenges of distribution for medicines. There are peaks in childhood diarrhoea: in the rainy season, and again in April/May when the groundnut harvest brings in a complete change in diet that causes many upset stomachs; an inconvenience for adults but potentially dangerous for children. Yes, he said. The ColaLife idea might work. Sometimes you could find a shop in the gaps between health posts; and in any case – as we were acutely aware of his queue outside – it might help if ORS were available elsewhere. It was definitely worth a trial. As Malama and Nachi explained that evening, the government is trying to ensure Health Posts are established ‘where the people are’, to provide at least some basic services within reach of communities. Yet still, both they and Rev Chitundu agreed, there are challenges in covering the vast distances. On the way back we decided to do a bit of spontaneous market research to test these insights. We stopped at a couple of roadside shops – one of them sited 10km from the next health service in either direction. We bought a Coke each and one for Yombwe (our guide), and started up a conversation: How many crates of Coke do you get a month? How much does it cost to bring it here? Does the Coke lorry stop off on its way past? Do you sell soap too? How much is that? There were some surprising insights: now, bottled water sells at the same price as a small glass bottle of Coke in rural areas: 3,000 Kwacha. And where we asked, for every bottle of Coke sold they now sell 2 bottles of water. It’s a bigger bottle. It’s OK to take away. Then, opening the boot of our car, we produced our own crate of Coke, complete with AidPods. It’s well known in Zambia that Mzungus (white people) tend to do crazy, unfathomable things. But buying a Coke when you already have a WHOLE CRATE of your own in the car? We explained the AidPod. Interest dawned and slowly the questions started to come the other way. Could they keep the AidPod? When would we bring more? Yes, the crate now held 29 units to sell, but the transport cost to bring it in would be the same. Yes, they would sell such a thing. Yes, it was more than an hour’s bike ride to the clinic, and some people had no bike. An oxcart trundled past. At least 3 hours to the clinic in that, and they are a rarity in northern Zambia. There are still a lot more questions to answer, a lot of assumptions to test and a lot of plans to make, but we will get there. At the DDPS site restaurant that evening, we bumped into a group of mothers and carers from a World Vision child nutrition workshop. Of course, out came the crate with Aidpods: we couldn’t resist running the idea past this impromptu focus group. And once we’d got past the ‘crazy Mzungu’ stage a lively conversation started, as they unpacked the AidPod, looked at the soap and the SODIS bag, and broke open the unfamiliar, orange flavoured ORS packet, to taste it. Shame we never learnt to speak Bemba – must sort that out next time around.